UDM Downloads > XLS Format Recovery! You would not be like to lose a bit of information from your crucial data. Like in MS Excel, your entire records and data that is saved in XLS format will be waste for you if you lose a bit of information. A workbook can contain unlimited work sheet so that we have to be more careful while using any XLS File Recovery Software. Virus attack, system malfunctioning, unexpected shut down or Trojan attacks are the most common factor that leads to data corrupt. But now you can easily or simply remove Worksheet Error and can recover XLS Worksheet with the help of Damaged Excel File Recovery Utility. Damaged Excel File Recovery Utility is one of the most popular & easy solution to recover your lost information with without any changes of original format. Software recovers all your lost crucial data information, which can gear up many of your important operations. 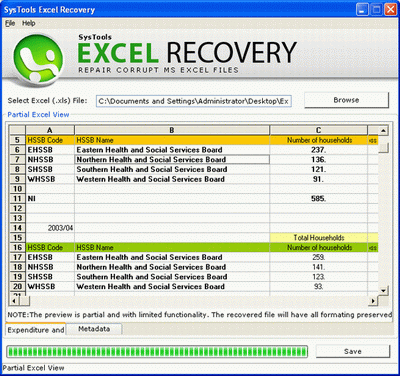 SysTools XLS File Recovery can help you to get your Corrupt Excel File and can restore with its original format. SysTools Excel Recovery recovers Excel files texts, charts, hyperlinks, merged cells, groups, images, numbers, comments, formulas, subtotals along with the names of the worksheets and many more. Software successfully supports all version of MS Excel such as 2010/2003/2002/2000/97 & run smoothly on Windows 98/ME/XP/2003 & Win 7.If you want to try this software, you can get our demo version of SysTools Excel Recovery software from our site which will help you to get the more information about the software. Demo version is enough to judge the efficiency of the software. After getting the satisfactory response, you can buy XLS Format Recovery with reasonable price at $49.